Abstract: Looking no different than any common 2.5" notebook hard drive, the trick up the Momentus XT's sleeve that it learns what data you frequently use and caches this to its 8GB of internal flash memory. HD Tach 3.0.4.0 Source: TCD Labs Inc.
HD Tach is a physical performance hard drive test for Windows 95/98/ME and Windows NT/2000/Vista/7. In Windows 9X/ME it uses a special kernel mode VXD to get maximum accuracy by bypassing the file system. A similar mechanism is used in Windows NT/2000/XP. HD Tach reads from areas all over the hard drive and reports an average speed. It also logs the read speeds to a text file that you can load into a spreadsheet and graph to visually read the results of the test. Higher bandwidth (MB/s) and lower latencies (ms) are better. HDTach tests burst speed, a measure of how fast the system can transfer information from the hard disk to RAM. 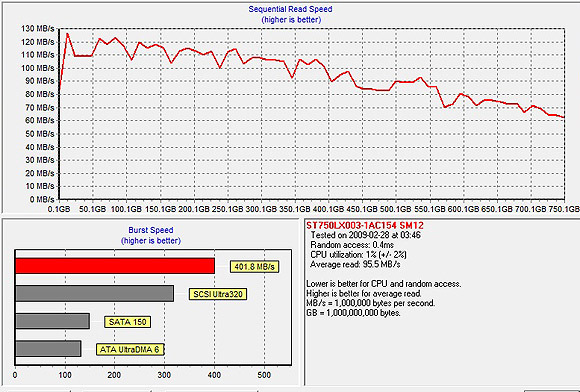 Thanks to the 8GB of adaptive memory, the 750GB Seagate Momentus XT SSHD drive seemingly does very well here - 405.1 MB/s! However when it comes to average read rates the 750GB Seagate Momentus XT achieves much more realistic results - 95.9MB/s.